Status and trends: The Bluenose East herd estimate was 38,592 ± 4,733 (95% CI) caribou in June 2015. The trend is only measured since 2000 as the herd was earlier included with Bluenose West and Cape Bathurst herds. The 2000 to 2010 trend is uncertain: 104,000 (± 22,100 95% CI) and 114,472 ± 6,908 SE in 2000 and 2010, respectively (Adamczewski et al. 2013), but the intervening estimates in 2005 and 2006 were lower. After 2010, the herd clearly declined to 68,300 ± 7,610 SE between 2010 and 2013 and that decline accelerated by 2015 with a halving rate of 2.4 years. Herd size in 2015 was 63% of the 2010 estimate. Ecology: The Bluenose East herd has a higher percentage of its annual range (79%) within the boreal forest than neighbouring herds. The calving and summer ranges are on the tundra and mostly underlain by the Precambrian Shield which influences topography, drainage and vegetation. Trends in winter range overlap with neighbouring herds are unreported but are extensive in some years. Wolf and grizzly bear sighting rates on the calving grounds were annually variable for wolves and an increasing trend in bear sightings from 2010 to 2015 reaching 6 wolves and 8 bears/10 flying hours in 2015. Wolf sightings on late winter ranges were recorded from 2009-2015 and averaged twice as high (22 ± 2.7 SE wolves/10 hours) as recorded for the Bathurst herd (WRRB 2016). 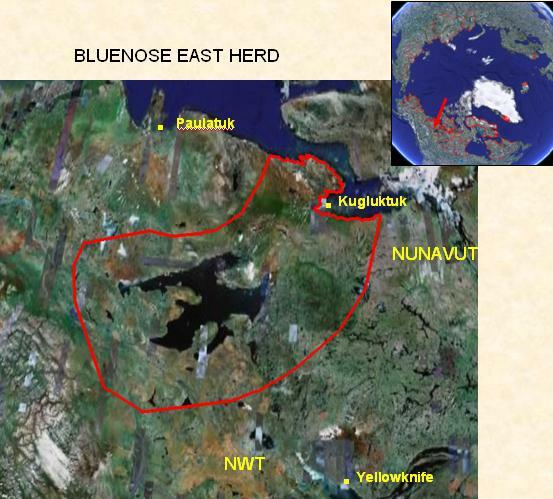 The Bluenose East herd is primarily harvested by Sahtú Dene and Metis, Inuit, Tlicho and Deh Cho in nine communities; Behchoko, Deline, Gameti, Kugluktuk, Norman Wells, Paulatuk, Tulìt’a, Whatì, and Wrigley. Annual harvests between 2009 and 2013 averaged 2,700 caribou, which may be an under-estimate, and were mostly cows (WRRB 2016). While there is concern about the effects of industrial exploration and development, no operational mines occur within the herd’s range and exploration has been relatively infrequent. Climate: The climate is similar to the Bluenose West and Cape Bathurst with colder and drier winters but relatively warmer calving and summers due to an increasing continental effect. Warmer and drier summers increase both the drought and the oestrid index. Significant trends (1979-2016) include fewer days with freezing rain, lower snow depth in May and June, increases in June plant Growing Degree Days, the drought and oestrid index and a warmer fall temperatures.The drought index peaked during the late 1990s and then again in 2012 and 2014 when the index was twice the average. Monitoring: Estimates of herd size were based on photography of post-calving aggregations in 2000, 2005 and 2006 while calving ground photography was used in 2010, 2013 and 2015. Pregnancy rates from hunter-collected samples were low in 2010, 2012 and the pregnancy rate was likely 64%. Late winter calf-cow ratios were high 2004-2011 and <30 calves:100 cows in 2001, 2012, 2014 and 2015 (WRRB 2016). Harvest is partially monitored and averaged about 2700 caribou/year mostly cows for winters 2009-2010 to 2012-2013. The harvest may have been at least 4000/year and as a percentage of herd size increased during the decline and may have been as high as 10% in 2015 (WRRB 2016). Management: Mechanisms for the decline are uncertain but the warm summers of 2012 and 2014 with severe drought conditions and the high rate of harvest may have combined with predation to accelerate a decline. The herd’s annual range is within the jurisdiction of Wek’èezhìı Renewable Resources Board, Sahtu Renewable Resources Board, Inuvialuit Game Council, Nunavut Wildlife Management Board, and the Governments of Nunavut and Northwest Territories. Coordination and information sharing about the herd is through the Advisory Committee for the Cooperation on Wildlife Management which is finalizing management actions and planning for the Cape Bathurst, Bluenose West and as well as the Bluenose East herds. After public hearings for the Bathurst herd in 2010, WRRB had recommended a harvest of 2,900 of mostly bulls for the Bluenose East herd as the survey information did not indicate a decline. After 2016 public hearings with information on a rapid decline, the WRRB and SRRB recommended increasing adult survival through harvest restrictions. Adamczewski, J., J. Boulanger, B. Croft, T. Davison, H. Sayine-Crawford, and B. Tracz. 2013. A comparison of calving and post-calving photo-surveys for the Bluenose-East herd of barren-ground caribou in the Northwest Territories, Canada in 2010. Department of Environment and Natural Resources, Manuscript Report No. 245, 62 pp.